margarita earrings Silverchilli - Beautiful fair trade sustainable silver jewellery from Mexico. 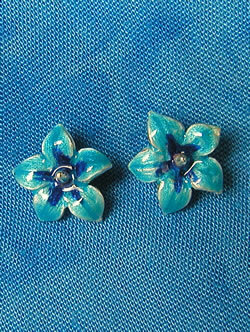 Feminine silver flowers picked out in two tones of enamel. Available in several colour combinations featuring yellow, soft pink, lilac and blue as shown. Handcrafted from 100% reclained silver, they are not only fabulous but fair trade certified too. These earrings are approximately 10mm in diameter.